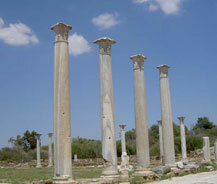 The spectacular ruins are 8 kilometers North of Famagusta. The ancient city of Salamis was constructed by the tribes who moved to Cyprus from Anatolia and Greece towards the end of the Bronze Age. The first king rules of Salamis was King Evalton, soon after Assyrian rule in 560 BC. Salamis, which was the capital of Cyprus in the centuries to come, was severely damaged during the earthquakes of 76 and 77 AD. Constantine rebuilt the city in the 5th century, and the city regained the title of the capital city once again. However, after the Arab raids and more earthquakes in the 8th century, the city was completely deserted.